Do you or someone you know care for an older person who has difficulty remembering to take the right medication? Someone who wants to remain living at home but due to confusion or early dementia is unable to take the right pills at the right time? Making sure that someone has taken their medication can be stressful, especially when you are supporting someone at a distance. We are looking for carers who look after an older family member, who would be happy to share their story. 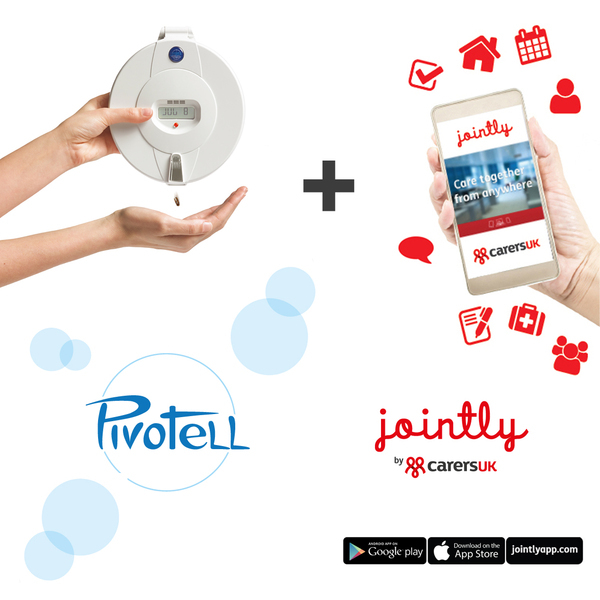 We would like to offer the free of charge use for one year of a Pivotell automatic pill dispenser with the Jointly care co-ordination app from Carers UK, and for carers to give us their experience of using this technology. Further info on the technology here: Pivotell. The dispenser can send alert messages to family members if medication has, or has not been dispensed from the device at the medication time so that appropriate action is taken to check on the wellbeing of the individual before a potentially adverse event occurs. And, using the Jointly app, families can receive and store these messages in one central place, and share them with everyone involved in someone’s care. Pivotell automatic pill dispensers have been used by the NHS and local authority adult social care for vulnerable adults who have difficulty remembering to take the right medication since 2002. Please email Nicky Green at [email protected] with your name, location, email & contact number and a short description of your caring experience. If chosen, we will supply you with a Pivotell Advance GSM pill dispenser and Jointly app, and all messaging costs free of charge for a period of one year. Your story may be used in a media campaign by Pivotell and Carers UK and will potentially appear in national and consumer media, please confirm if you are happy for your photo and story to be used in this way when sending your message.